The different CLEAN BOX versions have been designed for the effective cleaning of small but also of large and cumbersome parts. This means that the system is applicable in various factory areas and production fields, such as in maintenance, machine building or commercial construction. The CLEAN BOXes stand out for their closed loop system, their easy handling and the use of low-temperature cleaners. Using the CLEAN BOX systems is environmentally and employee-friendly. Every Box features a closed loop system which facilitates a long service life for the cleaner. A feed pump delivers the cleaning fluid through the washing brush, and afterwards it flows back into the storage tank. With the portable CLEAN BOX, the parts can be lifted by means of the immersion basket while the cleaning fluid remains in the box. In addition, the CLEAN BOX systems have been specially designed for manageability and easy handling, which eases the employees’ physical strain. Moreover, using these systems will reduce energy costs because contaminations are already removed efficiently at ambient temperature. The CLEAN Blue cleaners, such as CB 100 Blue, are particularly well suited for use in the various systems. All Boxes can be covered with a lid to avoid odour nuisance or evaporation of the cleaning fluid. The CLEAN BOX systems are based on one another and have been especially designed for the different cleaning requirements in the workplace. The CLEAN BOX, the CLEAN BOX Mobil and the CLEAN BOX Flow are designed for mobile cleaning of small parts. In addition, these Boxes save space because they are stackable. The CLEAN BOX Max 1, the CLEAN BOX Max 2 and the CLEAN BOX Flex, however, are suited for the removal of contaminations from bulky parts. With their trolley, the CLEAN BOX Mobil and the CLEAN BOX Flex are comfortable to push to the individual workplaces, and the CLEAN BOX is easy to carry thanks to its handles. The bigger cleaning platforms Max 1 and Max 2 can be transported by means of a pallet truck. So, the parts to be cleaned do not have to be transported to a cleaning station, which helps avoid additional risks caused by unwieldy or heavy parts. CLEAN BOX: Handy, easy to handle, stackable, and space-saving. Also portable thanks to its handles. CLEAN BOX Mobil: The cleaning box is extended by a trolley, which makes it easy to push the Box to the workplace without much effort. CLEAN BOX Flow: Integrating a battery-powered pump and a washing brush makes manual cleaning easier. The cleaning fluid is filtered through a set of drains, which extends service life. The system is a combination of the Box and a transport trolley, which makes the Box easy to take to the parts to be cleaned. In addition, there is space on the trolley for jerricans or work pieces. CLEAN BOX Max: Large parts can be placed on the cleaning platform and cleaned manually by means of a flow nozzle with an integrated washing brush. 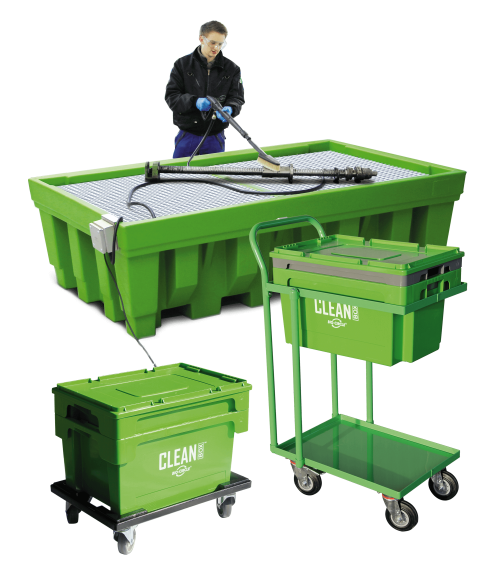 The big cleaning box is available in two sizes (Max 1 and Max 2). CLEAN BOX Flex: Similar to the CLEAN BOX Max, the Flex model is suited for large work pieces. 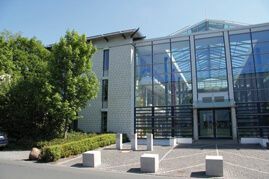 In addition, it can be extended in size as desired and features an integrated collecting tray in compliance with the WHG (German Water Resources Act). The BIO-CIRCLE in your company. Take a look at the site and see for yourself the excellent cleaning performance while providing the best protection for users and the environment. We provide alternative system solutions in the field of surface technology with a special focus on sustainability and OSHE, without impairing efficiency.